Actually, all of the above. When you truly step back and think about how you can achieve this, it falls together quite nicely. The misconception that the more you work and the harder you work, the more successful you’ll be quite frankly needs banishing. Yes you do need to work jolly hard, but you also need to work smart. And that’s the vital difference. Sitting still, watching TV, just ‘being’ probably makes you feel uneasy. In this fast-paced life in which we live, we feel we always need to be busy. There’s always a never ending to do list, things to be done, goals to smash. Yet taking that time to ‘just be’ is actually really beneficial for us. Unlike our digital devices we’ve become so reliant on, our minds are not programmed to take on so many tasks, flitting from one client to the next, working on several projects at once. Our brains benefit from categorisation and rest – what we may perceive as ‘wasting time’. In finding the time to rest (however you choose) you’ll actually be more productive for the remainder of your working day. You have to look at taking a break as an investment in your own health. It’s likened to going to the gym. You spend an hour doing something that will later have multiple benefits to your brain and to your body. Schedule that time into the diary so you can’t forget about it. It’s as important as that meeting with a potential client. The approach of author and entrepreneur Tiffany Dufu is simple. “Maintain a laser-like focus on your purpose and delegate everything else.” As her brand grew, she did less (thanks to the wonderful powers of outsourcing) and started to achieve a lot more. She was able to concentrate her efforts on tasks that would offer a much bigger reward. The writing and successful launching of a global book for example. Procrastination is a real issue and something that pops it head up over and over again. It’s generally caused by a lack of strategy. If you’re multi-tasking, unsure of how best to proceed or lacking confidence to do a task, you’re more likely to procrastinate. Whether you like it, mean to or want to! When you’re juggling multiple tasks, your brain subconsciously feels overwhelmed. That anxiety triggers a coping mechanism which sends signals advising you of how to cope with the situation. Generally, it’s to move yourself away from those thoughts and whatever is causing them. Enter – procrastination! Ironing has never looked so appealing, right? Avoiding falling into this trap is vital. If you can limit the chances of you feeling this way, you’ll increase your productivity and reduce those procrastinating thoughts. Double win! Are you ready to take control? 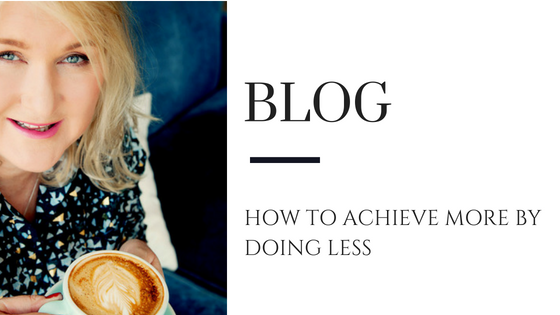 If you’re wanting to achieve more (and do less!) most of what I’ve mentioned so far will relate. You’ll realise those times cleaning your office was procrastinating at its finest (sorry!) and that it really is OK to have a rest. But now it’s about finding the routine that works best for you. Outsource, outsource, outsource. Spend time doing valuable tasks. Those that will make you the money, grow your brand and give you the success! It is possible, it is encouraged and it’s wonderful when you have that realisation. Life’s too short to work tirelessly, exhausting yourself and threatening your mental health. Now take a deep breath, and repeat after me. “I deserve that break…” and take it.